REGISTRATION IS NOW OPEN!! Click here to register online. Who is ready for an adventure? EVERYONE gets a first-class seat ont his trip. Get ready for STEM, Handcrafts, Scout skills, and more outdoor fun! Price includes camp shirt, daily snack, and a whole week of fun and adventures! To participate in Cub Scout Day Camp, a boy must be registered with a Cub Scout Pack. Boy Scouts of America registration is $14 in addition to the Day Camp cost, including boys who are just beginning as Tiger Cubs (as of June 1). No person or groups will be excluded because of race, color, national origin, or hardship for participation in Cub Scout Day Camp. Transportation to and from camp is the responsibility of the parent/guardian. A camp T-shirt will be provided to each participant on the first day of camp. Each camp participant is required to wear an official camp T-shirt everyday with shorts/pants and closed-toed shoes. No open-toed shoes will be allowed. Each camper will need to bring water (refills available at each station) and lunch. Snacks will be provided. Any medication, including inhalers and epipens, need to be given to the Camp Medic stationed at camp. All medications must be picked up from the Camp Medic at the end of each day. Minor children will transport no medications. The “Tot Lot” provides a Day Camp experience with activities for young children of Staff members, Den Leaders and parent volunteers. In order for a child to attend Tot Lot, a parent MUST be in camp while they attend. We do not provide day care for Scout siblings. In addition, each attendee must be toilet trained or other arrangements made. Our camp has an exciting program for incoming Tiger Cubs in order to introduce them to the fun of both Cub Scout Day Camp and Scouting. Tigers are invited to attend the week’s camp activities. Any incoming Tiger who registers for camp needs to have an adult partner accompany them every day. In addition, incoming Tigers must also complete a BSA Cub Scout registration form. 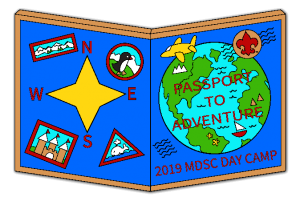 We will provide a list of District Packs to encourage continuing in Scouting following Day Camp. Boy Scouts & older siblings, who are at least 14 years of age, are invited to volunteer as Camp Aides. Scouts will have their service hours recorded and they will be given a letter providing proof of service at the end of each camp session. If an adult attends camp on Staff for the week, older siblings, and those between the ages of 13 and 14 years may also assist their parent as a Camp Aide. All camp Den Leaders, Volunteers and Staff Members are required to attend a Camp Leader training session prior to camp. The time and location will be announced at a later date. This training is mandatory for our national standards and accreditation. In addition, each adult must also have taken Youth Protection Training. Youth Protection Training may be taken online at www.scouting.org. If you have taken the Youth Protection Training within the past year, you do not need to repeat this for camp. You must however, print and provide your training certificate prior to the start of camp. Full and partial camper-ships are available for families with financial hardships. Please contact the Chief Solano Day Camp Director or Registrar for information about financial assistance. Camp fees are non-refundable except in cases of emergency. Emergency related refunds require a written request to the Camp Director. Each case will be considered on an individual basis. This entry was posted in Events on January 9, 2017 by Sue.